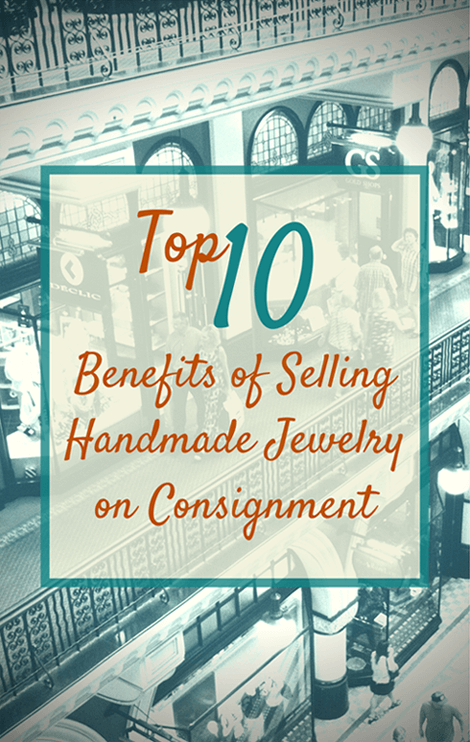 Selling on consignment can be a great way of getting your jewelry into many stores and generating a consistent income. There are however, precautions you will want to take to protect yourself and your business. Although I no longer sell jewelry on consignment myself, I have done so in the past with good and not so good results. One of the most important steps in selling on consignment is to establish a good relationship with the store owner and to have your transactions documented by using a consignment contract and invoices or inventory forms. Let's start with the benefits of selling on consignment. I always believe it is best to lead with a positive approach in order to set the tone for positive results. Jewelry consignment is a great way to get exposure for your jewelry line and often an easier way to break into the wholesale market. There is little risk for the store owner to display your jewelry in their shop because there is no cost incurred for the owner. The owner will only make payments once your product has sold and is not left holding inventory that will not sell. You will likely have greater input into where and or how your product should be displayed. With regular visits to the stores you consign with you can ensure that your product is getting the exposure required to do your work justice and get the sales. Generally there are better profit margins on what you will make per piece. A typical example of a consignment payout is a 60/40 split. The artist receiving 60 percent of the sale and the store taking 40 percent. When wholesaling your product the store will typically double your wholesale price. In other words you are getting 50 percent. When selling on consignment you will set the retail price, which will be double your wholesale price, and then you will typically receive 60 percent of that. There is often greater flexibility in choosing which products you would like to showcase such as one of a kind pieces or designs that you will not offer in your wholesale line. While I am not suggesting that you dump all your unwanted merchandise on consignment (after all you do want it to sell), it can be a place to exhibit any items you have made larger quantities of. These items are of no use sitting in a drawer. Also, If you exhibit your work at craft shows you may not always have the space to show all your work. As you change up your line or introduce new items you can try rotating groups of items or styles at different shops on consignment. Sometimes a fresh environment and a new audience is just what those pieces need. Depending on how well your work is received, selling jewelry on consignment can produce regular monthly income, provided you keep on top of replenishing stock. Selling on consignment can often lead to closer relationships with store owners. Having more involvement in the up-keeping and selling of your product is a good motivator for shop owners and staff to move your product. Selling on consignment to multiple stores, with staggered, payout dates can produce a more consistent income that is spread throughout the month and year making for better cash flow. Having regular locations to showcase your work while you are not exhibiting at shows or selling online can provide a steady income and is generally not weather dependent. You also have the advantage of cashing in on an already established clientele while you build your show repertoire or online presence. Store owners are often open to artists bringing their own product displays and some are even thankful that you will provide a display. This puts you at a unique advantage in that you can design a display that not only compliments your work, but will also house a good number of your pieces. Make sure that if you are providing a store with a custom display that the store understands that the display is intended to showcase only your jewelry collection. Learn how to get more consignment contracts with your own custom displays. There is great advantage to having regular locations where you can consistently showcase your work without having the overhead costs of maintaining a store or paying for a show booth. You need to keep good documentation and regular inventory checks. generally product deliveries will be done in person. Because you are supplying in bulk you don't have to worry about shipping one item at a time as you do with online orders. Having other people sell your product without incurred cost will not only save you money, it will free up your time to create. Although you are only getting a percentage of your retail figure you have to consider all the fees involved in paying for craft show exhibition space and weigh the two. With consignment you are not only saving on exhibit fees, you will have your own sales teams at various locations and that does not cost you any up front money. That alone has great value. After all, you cannot be in two places at the same time, but you can certainly have other people representing your work in many places.